In a musical career that spanned five decades, David Bowie (1947–2016) earned his place in history as one of Britain’s best-loved musical artists. Given Bowie’s huge impact on the music world, it is unsurprising that memorabilia from throughout the star’s musical career continues to prove popular when it goes under the hammer. Lot 963 in this month’s Works of Art, Medals, Militaria and Furniture auction is an interesting poster for Bowie’s Outside Tour. The Outside Tour opened in the United States, starting in Connecticut in September 1995, and was followed by a British and European leg. 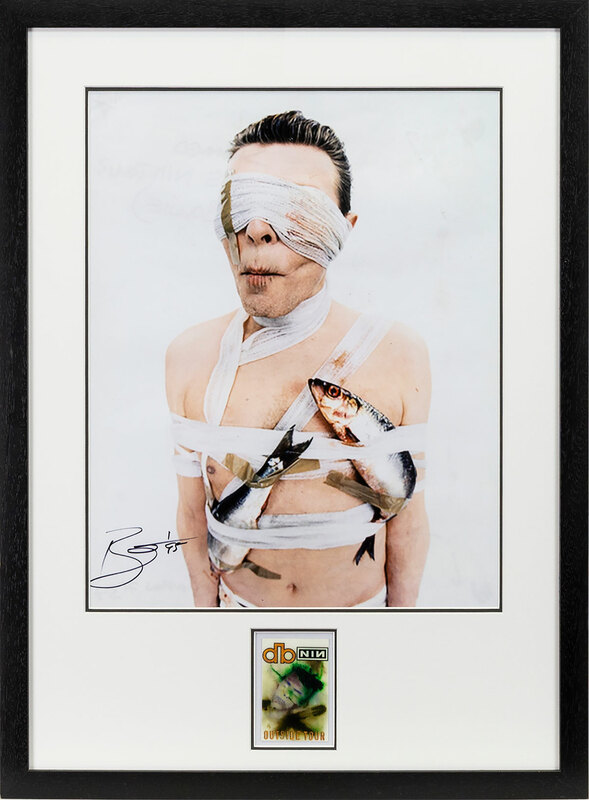 This quirky promotional poster for the tour – which shows Bowie bound with bandages and adorned with two fish – is signed by the artist and framed, the frame mounted with a brass plaque certifying authenticity. This rare piece comes with an auction estimate of £700–1000. 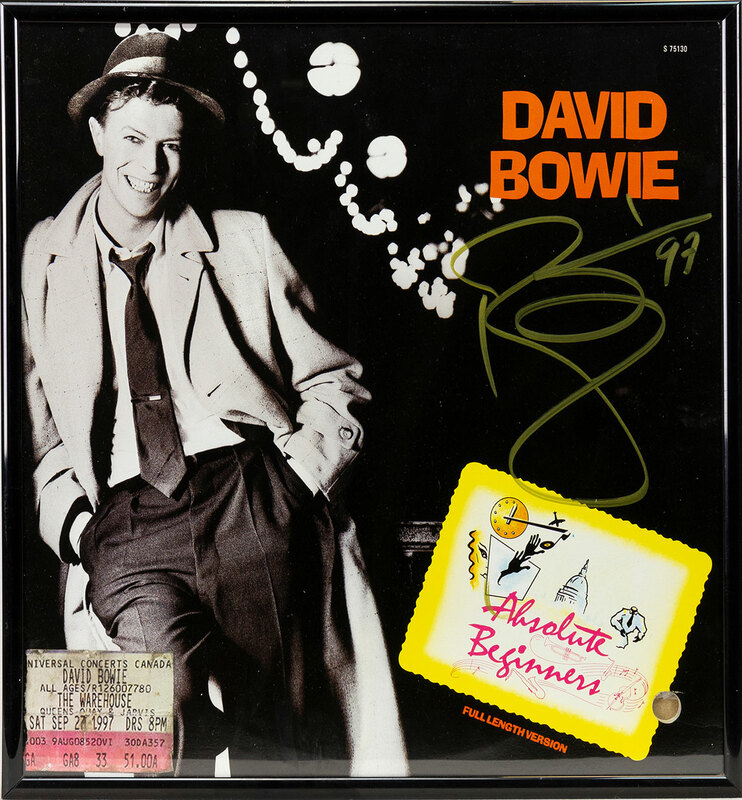 Also of interest to the Bowie fan, lot 965 features an ‘Absolute Beginners’ vinyl, signed by the artist and dated ‘97. The song was recorded by Bowie as the theme song for the 1986 film adaption of the book Absolute Beginners. The song was notably more successful than the film, peaking at the number two spot in the British charts. This special vinyl comes with an attractive auction estimate of £150- 250. Whilst Bowie may be the headline act, there’s certainly an all impressive line-up this Friday. 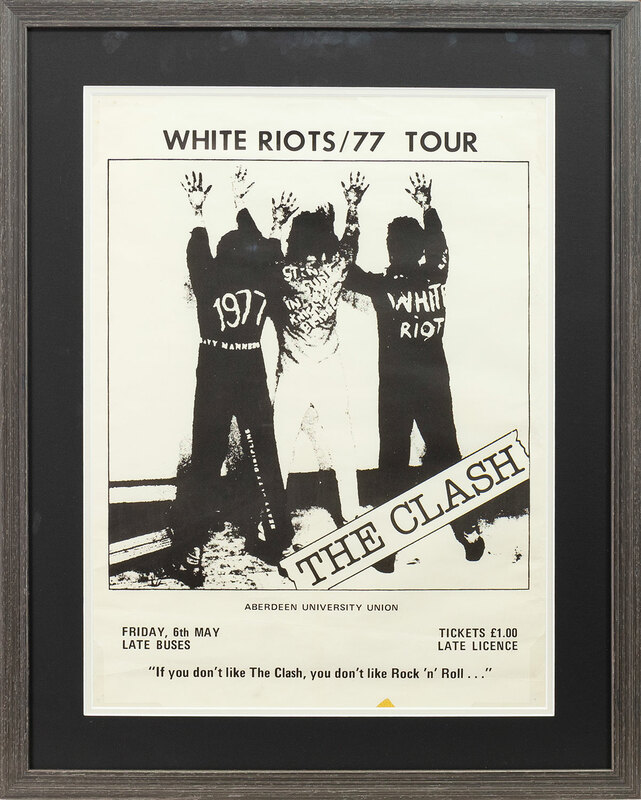 Another exciting lot is a promotional poster for a gig by ‘The Clash’ at Aberdeen University Union in 1977 (lot 964). This impressive black and white poster has tremendous visual impact, and an auction estimate of £400–600. Alternatively, if you’re interested in all things celebrity, lot 918 could be of interest, featuring an extensive autograph album which contains a whole host of signatures from celebrity stars. The collection was compiled by the father of the vendor of this lot, who once mingled with the stars during his employ at the Gleneagles Hotel in Perthshire. This lot comes with an auction estimate of £120–150.